To increase the use of the kerbside Food Organics and Garden Organics (FOGO) service in Bathurst, Forbes, Orange and Parkes, EnviroCom launched the Pledge Campaign on behalf of NetWaste in mid-2018. The campaign asks residents to “take the pledge” to put all their food waste in the FOGO bin rather than in the household garbage bin. The ‘We’re doing it…are you?’ Pledge Campaign aims to increase awareness that all food waste should be placed in the green-lidded FOGO bin and establish this as a social norm. Those who make a pledge receive a pledge campaign bin sticker for the front of their FOGO bin, a factsheet with a range of helpful hints and tips, and are placed on a mailing list to receive regular FOGO related updates from EnviroCom. Residents are encouraged to make their pledge at frequent public place displays held by EnviroCom staff or can pledge online via the NetWaste website. The campaign has been supported by an extensive media package including TV, radio, social media and newspaper advertisements, and has received media coverage of its own! Over 750 pledges were received as the campaign garnered significant momentum during its first year, becomingly increasingly recognisable across the region. EnviroCom and NetWaste will build on this during a second year of the program, continuing to motivate households in the Central West to use their FOGO bins and keep food waste out of local landfills. 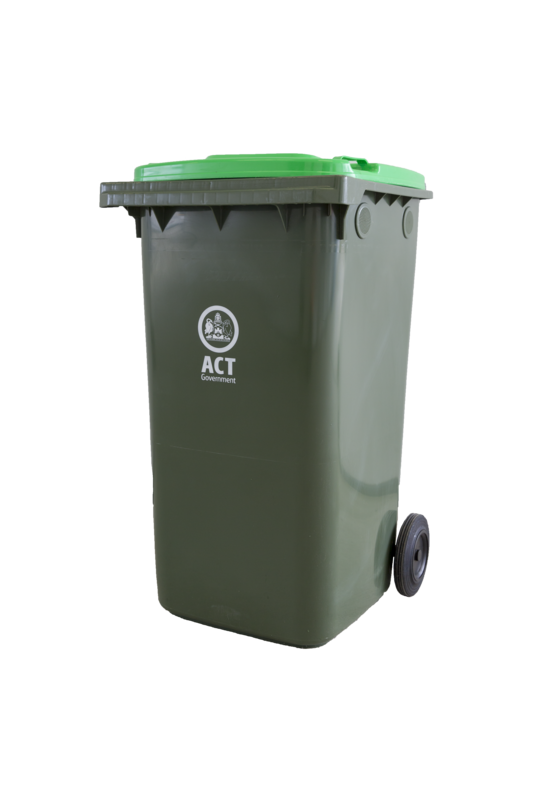 In April 2017, the ACT Government launched a brand new green waste service for the areas of Weston Creek and Kambah. Due to the initial success of the service the area of Tuggeranong was added into the service area in January 2018. The service operated on an opt-in basis where residents pay a one off $50 cost recovery fee. The uptake of the service was tremendously popular with 63% of residents opting-in for a green waste bin since the service commenced. EnviroCom has been responsible for marketing the new service and providing education to residents about how to use their new bin. To date, nearly 16,000 bins have been inspected by EnviroCom staff over the past two years with 92.5% of the bins being free of contamination. From April 2017 – April 2019 the service collected 8543 tonnes of green waste, which also includes the addition of the Belconnen area to the service in September 2018. As of 1st April 2019, the green waste service is now available across all of the ACT. The service remains optional with the one off $50 fee. EnviroCom will provide three full time staff moving forward to ensure the ongoing success of this green waste service by continuing bin inspections, running facility tours, staffing pop up displays and designing education materials. 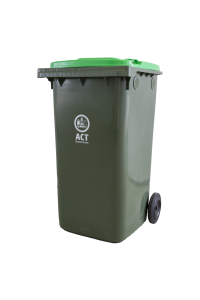 Targeted community education and engagement will assist ACT residents to use their green waste bin correctly helping to divert a valuable resource away from landfill. The collected garden waste will be turned into mulch products which can be purchased by residents at a discounted rate. In 2018, EnviroCom developed a Waste Education incursion that focused on promoting improved waste management within schools. The incursion was specifically tailored to Stage 3 and 4 students and involved a student led Waste Stream Assessment of the participating school’s rubbish bins. After completing this waste audit, participating students from Windsor High School, Hawkesbury, NSW, entered a competition called ‘Innovation Nation’ run by the Foundation of Young Australians which required them to develop ideas for social and environmental change. The submission detailed how the students had developed a Waste Management Program called the ‘Cash Cage Project’. The Project aimed to reduce landfill waste volume within the school through rubbish reduction and better recycling and was adopted by the whole school community as students and teachers embraced the program. Windsor High was one of 10 entries selected on the merit, worthiness and the ability of their project and they received a $1,000 micro grant, online resources as well as coaching sessions with experienced business leaders to help assist in the Project. The money earned from the ‘return and earn’ part of the Cash Cage Project was used to purchase compost bins to further reduce waste in the school environment and produce compost for use in the school gardens and agricultural plot. In recognition of their outstanding waste minimisation achievements, Windsor High School was awarded the Hawkesbury Environmental Award at the Hawkesbury Australia Day Awards 2019. Staff from EnviroCom NSW attended the 2018 Premier’s Awards for Excellence in Public Service, having been nominated for their collaborative work with Orange City Council in the “Keeping Our Environment Clean” category. The Orange City Council Waste Diversion Education Strategy 2016-2021 was recognised for its holistic and long-term approach to maximising waste diversion and supporting sustainable waste and resource behaviours through education and engagement. The Strategy aims to assist the Orange LGA to meet or exceed several of the targets set in the NSW EPA’s Waste Avoidance and Resource Recovery Strategy 2014-21, including increasing the waste diverted from landfill to 75%. The awards night was held at Sydney Town Hall on November 7th 2018 and was attended by EnviroCom’s Regional Manager, Donald Munro and Orange-based consultant Chris Dart, alongside Wayne Davis from Orange City Council. The Strategy was initially developed by EnviroCom General Manager Paula Harrison and overseen by Rachel McIntyre. While the team were not the overall winners of the Premier’s Awards on the night, the nomination was acknowledgement of the team’s strategic approach to achieving long term waste diversion in the Orange City Council region. In 2017 EnviroCom undertook a research project to investigate options for the recycling of food waste produced at Sunshine Coast Council facilities and events. The project aimed to provide Council with recommendations for methods to process food waste to reduce emissions, waste to landfill and to create a product that could be reused on Council owned parks and gardens. Multiple technologies for organics processing were identified and compared against various criteria specific to Council’s requirements. These criteria included spatial and infrastructure requirements, environmental considerations, capital/ongoing costs, ease of use and legislative requirements. EnviroCom was able to determine the processing requirements based on data collected in previous assessments of Council facility and event waste and recycling streams. From this data, potential implementation sites were highlighted and an appropriate processing option recommended. The research project provided Council with an opportunity to reduce both waste to landfill and the carbon footprint while turning the food waste into an organic resource that could be utilised locally. 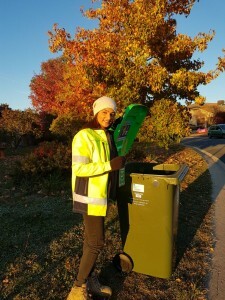 In 2017, EnviroCom established an environmental education and projects officer position in Australian Capital Territory (ACT) to support the roll-out of the Green Bin Pilot Program (green waste service). The green waste service is provided by CorkHill Bros. and JJ Richards & Sons on behalf of the ACT Government. The initial pilot program was aimed at households in Chapman, Duffy, Fisher, Holder, Rivett, Stirling, Waramanga, Weston and Kambah only, with expansion planned for 2018. This greenwaste contract is the first of its kind in the ACT and has been met with growing interest since its establishment. EnviroCom’s role as the educator includes the recruitment of new participants in the opt-in collection, promotion of correct use of the service to minimise contamination and monitoring of current use and contamination. The pilot has resulted in very low rates of contamination (<1%) in the green waste collected. These low rates of contamination are supported by a range of communication and marketing program elements including regular bin inspections, community consultation events, public place displays and other education opportunities at the request of community members. In April 2016, EnviroCom undertook a waste audit of the Sunshine Coast Council’s Offices and Depots. The purpose of this audit was to reassess the waste management at selected Council facilities and track changes from 2015 baseline data. The reassessment focused on the rates of waste generation and the waste stream composition from these sites to assist in providing comparative data to assess progress within the Council’s Internal Waste Reduction Action Plan (iWRAP) and the planning for environmental improvements and other sustainability outcomes. In conjunction with the reassessment ‘back of house’ waste audit, an internal ‘walk through’ waste audit was also undertaken at one of Council’s Administration Precincts. if the current infrastructure was adequate according to the number of staff located in the area. identified opportunities to minimise recycling contamination and maximising resource recovery. Ongoing monitoring and assessment of three key elements of effective waste management – behaviour and knowledge, infrastructure and services, and policies and procedures is imperative to ensuring sustainable outcomes. EnviroCom Australia, in conjunction with the Hawkesbury District Agriculture Association and Hawkesbury City Council, designed and delivered a public place recycling program for the 2016 Hawkesbury Show, one of the largest rural shows in NSW. The program was developed to improve waste outcomes at the show, with a particular focus on reducing recycling contamination rates. Prior to the event, EnviroCom liaised with vendors and show organisers to provide strategic recommendations on waste management logistics for show. During the event, a range of initiatives were implemented to better understand public waste disposal behaviours at the show and to educate visitors on best waste disposal practices. ‘Recycling Rovers’ conducted visual bin audits to determine common contaminants and contamination ‘hot spots’. The Rovers engaged with visitors to the Show, assisting them to use the correct bins and providing instant win prizes for patron seen to be recycling right. . Other public education activities such as recycling trivia were conducted at the Council tent. The program provided Council with valuable data into patron and vendor behaviours and recommendations to further improve waste management practices at future events through improved logistical planning and further public engagement strategies. Gunnedah’s ‘Porchetta Day Festival’ is a busy community event with a focus on local food, produce and all things Italian. 2015 was the Festival’s seventh year and so was the perfect candidate for introducing Public Place Recycling – to increase resource recovery on the day. In partnership with Council, EnviroCom advised with regards to education material, bin positioning on the day, flyers and signage – all with a focus on reducing the amount of waste generated for disposal at landfill and maximising the use of onsite recycling bins. Throughout the event EnviroCom hosted a recycling education stall on behalf of Council – handing out educational flyers and prizes to individuals who were spotted doing the right thing and recycling correctly. Resident surveys were also completed at the stall, with the community supportive of Public Place Recycling at events. A visual inspection of recycling and waste bins was also conducted on the day, to assess the contamination found within the recycling stream and estimate the quantity of resource loss in the waste stream. Overall the implementation of the program was a success with visual audits showing low levels of contamination in the recycling bins as well as minimum resource loss found within the residual waste bins. Is a fortnightly waste collection service feasible? Can it be done? What do residents think? Those were just some of the questions posed by a Orange City Council in 2015. So, in partnership with Council, EnvrioCom set about finding out – through the ‘Fortnightly Waste Collection Trial’ program. A pilot study was designed and undertaken with around 140 residents volunteering to complete an online weekly ‘Waste Diary’; with a further 20 selected to be ‘audited’ twice during the 12-week trial period. This involved hand sorting the contents of residents’ bins right in front of their eyes! Supported by educational materials and direct discussion with our consultants, the trial was a success, with the conclusion that the majority of residents could comfortably function on a fortnightly waste collection – with little or no change to current behaviours or practices. The data gathered was then collated into a final, detailed report which Council can now utilise as they consider whether to go ahead with the implementation of a fortnightly waste collection service.